← The back cover copy! 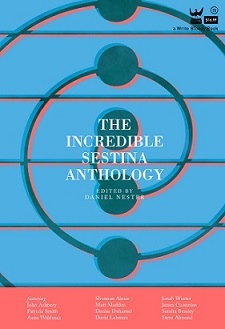 Sestina Inside Introduction to The Incredible Sestina Anthology! Here’s a screenshot of the introduction for The Incredible Sestina Anthology. Highlighted in bold are the end words/teleutons of a sestina I embedded inside. Like an Easter egg! We just put the book to bed, as in sending it to the printers soon. You might say we’re giddy. Pre-order it, OK? It’s coming out soon. This entry was posted in Uncategorized and tagged Easter egg, Incredible Sestina Anthology, Sestina. Bookmark the permalink.